What a great way to introduce children to scuba diving in a pool in less than six feet of water. Celebrate a birthday by throwing a memorable, exciting Bubblemaker party with friends and family with Mexico Blue Dream. It’s fun, easy and safe. Typical sessions last about 2 hours (sign up, gear up and fun included). 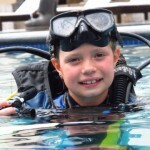 Children use all the basic scuba gear, which is made for their size and stature. We stock dedicated kids diving equipment and the tanks are just the same as the ones Mum and Dad use, just smaller. In order to have the best organisation, the reservations can be done till 6:30 pm the day prior to the activity. Children who are 10-14 years old can take the Junior PADI Open Water Diver course. Not 10 year old yet? You can still see what’s below the surface without scuba equipment. Kids do Ecology. Fantastic program for kids to keep exploring the underwater world. Your favorite swimsuit, your towel, and Mom or Dad to sign the release forms!